The Australian booked a spot in the final after a near three-hour classic against the 16th seed. The youngest of the four semifinalists? No problem. He's no longer a kid after the effort he put in tonight. Alex de Minaur roared back from four match points down in the second set tiebreak to knock out 16th-seeded Andrey Rublev to book a spot in the biggest final of his young career. He will now face reigning champion Alexander Zverev for the Citi Open title in what will be the youngest final on tour since Rafael Nadal and Novak Djokovic met in the 2007 Indian Wells final. The Russian was forced to deuce in his opening service game, and it was a sign of things to come for him later in the set. When serving from behind in the fifth game, Rublev had trouble finding first serves. This allowed de Minaur to jump all over those and hit solid backhand returns to put him ahead in the point. When down 15-40 though, the Russian came through with two massive serves to hold. He would do the same in the seventh game, saving two break points to hold as de Minaur could not do much against the massive serves of Rublev. 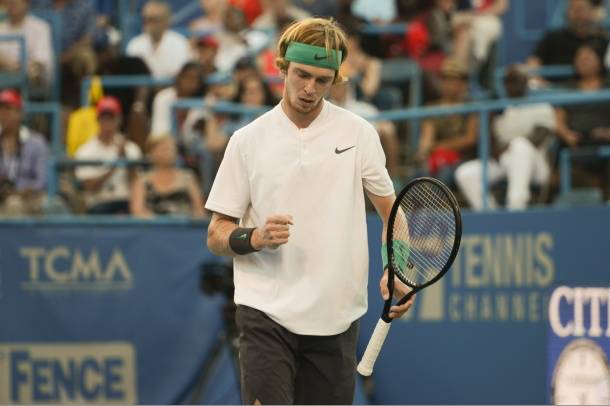 The 12th game was Rublev's chance to get ahead, attacking the Australian's forehand. He went on to grab the set 7-5 to move a set away from the final. After breaking to end the set, the world number 46 was looking to pounce again. He angrily reacted after being unable to convert his three break chances in the fourth game but was able to hold off the chance de Minaur had to go up in the fifth game. Despite the break opportunities for both players, neither could convert, taking this set into a tiebreak. Rublev took control of the tiebreak with the Australian hitting plenty of errors. However, with four match points, Rublev was unable to convert with the 19-year-old taking advantage of his serve followed by attacking short balls to force Rublev on the defensive. De Minaur forced a decider, much to the delight of the crowd who were truly entertained in this semifinal after the first semifinal between Alexander Zverev and Stefanos Tsitsipas was a straight sets win. Rublev shook off those four match points squandered with a break in the third game of the set, only to give it back in his following service game. As the 19-year-old Aussie continued to just chase down everything, the 20-year-old Russian looked very fatigued, playing his second match of the day. A backhand winner down the line in the sixth game set up 0-30 on the Rublev serve. His insane defensive skills were on full display, breaking for 4-2. Just like Rublev earlier in the set though, he gave it right back. De Minaur held his first match points at 15-40 in the tenth game. it was deja vu from the first set with Rublev, finding a way to produce some clutch tennis when behind to send it back to deuce. 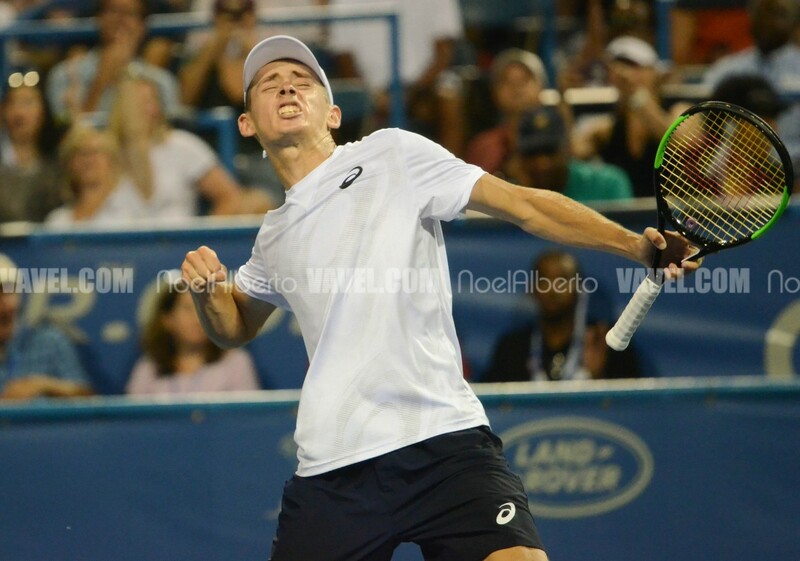 The Russian had one game point opportunity go awry, and it was de Minaur who clinched on his fourth match point ironically, to take the match after the Russian double-faulted.